Bento (弁当 bentō?) is a single-portion takeout or home-packed meal common in Japanese cuisine. A traditional bento holds rice, fish or meat, with pickled or cooked vegetables, usually in a box-shaped container. Containers range from disposable mass produced to hand crafted lacquerware. Bento boxes are readily available in many places throughout Japan, including convenience stores, bento shops (弁当屋 bentō-ya? ), railway stations, and department stores. However, Japanese homemakers often spend time and energy on a carefully prepared lunch box for their spouse, child, or themselves. 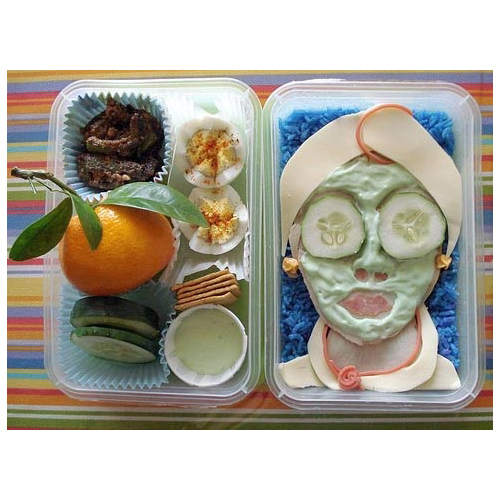 Bento can be elaborately arranged in a style called “kyaraben” (“character bento”). Kyaraben are typically decorated to look like popular characters from Japanese cartoons (anime), comic books (manga), or video games. Another popular bento style is “oekakiben” or “picture bento”. This is decorated to look like people, animals, buildings and monuments, or items such as flowers and plants. Contests are often held where bento arrangers compete for the most aesthetically pleasing arrangements.